Ella Bella Photography Backdrop Paper adds flair to your photography. 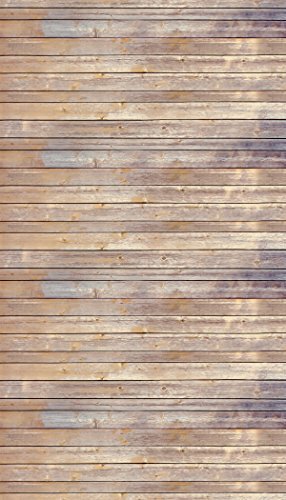 This roll comes in Vintage Wood, which is a stylish, antique wood design that can be used as a floor backdrop, a wall backdrop, or both. The design is printed on paper, and is created to help minimize light reflection, enhance your image and complement your subject. This backdrop is easy to use, no matter what your experience level, and is proudly made in the USA. To set the roll up, you can either use a backdrop stand, tape one end of the paper to the wall, or even use two chairs to hold the roll up. The pattern is seamless, and is printed with fade-resistant ink. Ella Bella Photography Backdrop Paper is ideal for newborn, children, and product photography, and can be used for video backdrops, displays, and online selling sites as well. The affordable price makes these backdrops great for cake smashes too! Whether you're an amateur photographer, a hobbyist or a professional, Ella Bella's colorful, inexpensive backdrops will make your pictures pop. With so many colors and patterns to choose from, you're sure to find the backdrop that best suits your style. If you have any questions about this product by Ella Bella, contact us by completing and submitting the form below. If you are looking for a specif part number, please include it with your message.